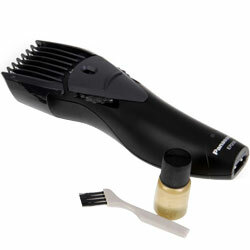 Order online this gift of Elegant Panasonic Trimmer for Men for your special one and show your love and affection. This Panasonic Trimmer is very handy and easy to use, as its specifications are Floating Cutter, Ergonomic S-Curve, Ultra High Energy Storage Capacity, Wide Blade, Easy Cleaning Brush, 12 Steps Length Adjustment (2-18 mm), Front Height Adjustment Dial. It also comes with Lessen Discharge N Facility and Lengthens Shelf Life.